If The Rolling Stones and The Clash decided to form a Supergroup, then I reckon that they would sound something like jointpop. 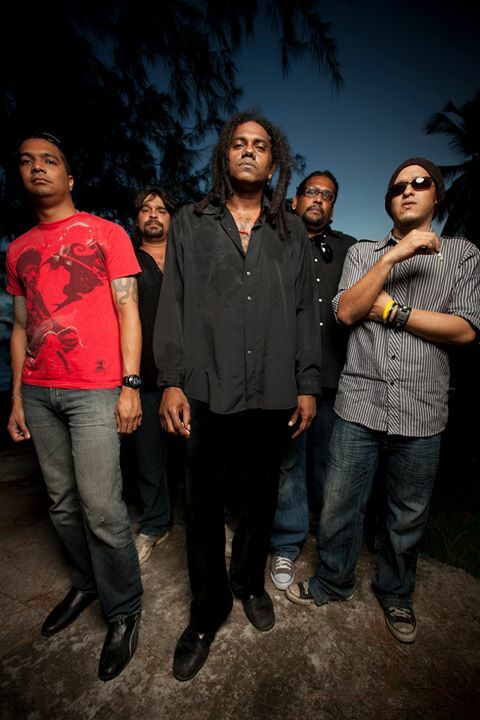 Based in Trinidad and Tobago, jointpop were formed in 1996 and their catalogue of music has won them support slots with Dolores O’Riordan, Blue Oyster Cult and Kansas. With their crunchy, scrapey, jangly and raucous riffs, jointpop are the Bona-fide live act, whose energy and exuberance is magnified through the raspy vocals and bouncing beats. Comprised of Gary Hector on vocals/guitar, Damon Homer on guitar, Dion Camacho on drums, Phil Hill on keys/synth and Jerome Girdharrie on bass, jointpop are a great, vibrant band whose fluidity of riffs make being in a band look so easy and spontaneous. As a frontman, Hector is a natural and charismatic performer whose varied tones gives him a sunny and uplifting disposition. Interestingly, just when you think you have sussed jointpop out, they hit you with a dash of space-rock that is customised by zany synths. Again, with the token melancholic piano, jointpop consolidate their blues-rock origins proving what dynamic musicians they are. Despite the happy-go-lucky and spritely persona of jointpop, they are a band of a political conscience, without forcing it down your neck. Currently working on their new album, jointpop have been involved in fundraising gigs and whose impressive music has put them firmly on the Manc Radar.